Pyramid magazine has long been a prime spot for amazing places to visit, and that's been especially true the past couple of months. 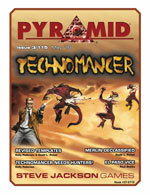 Pyramid #3/115: Technomancer revisits the world of GURPS Technomancer. The fan-favorite setting – with its combination of magic and modern-day mayhem – has always played well to the cross-genre strengths of GURPS. This issue provides plenty of insight into bringing this setting into GURPS Fourth Edition. Although not quite a full-blown Fourth Edition conversion supplement in the tradition of GURPS Reign of Steel: Will to Live, this issue of Pyramid still provides lots of tools to game in Technomancer using two popular Fourth Edition rule sets: GURPS Action and GURPS Monster Hunters. Now you can add magic to your Action campaigns, or fight the forces of darkness in Merlin with new options and opposition. Technomancer author David L. Pulver revisits the world itself, offering some fresh ideas to bring this setting closer to "today." He also delivers a batch of new GURPS Magic spells that should be interesting to add to scads of campaigns even beyond the realm of Technomancer. 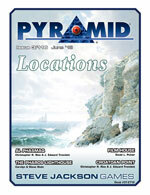 Pyramid #3/116: Locations is designed to help all sorts of hectic GMs. When you're planning an RPG adventure, there's nothing like a great locale to get the players' (and heroes') blood pumping, and this issue delivers four in one package. Prepare yourself for a batch of new places ready to add to myriad games, from a fantasy seaside port with secrets and subterfuge, to a Victorian mansion with a horrific mystery, to a science-fiction mining station that's a perfect spot for information or a fistfight. And there's still more herein! Pyramid #3/116 might be our most cartographically colossal ever, with maps included for all but one setting. And although it's designed for GURPS, this offering is flavorful enough for other gamers to find something worthwhile. Pick up Pyramid #3/115: Technomancer or Pyramid #3/116: Locations individually, or subscribe today to begin your journey with the most-recent issue and many more months of gaming goodness.